Everything you've been taught about food by your teachers, the media, the "government experts" is wrong. Here's the biggest fake fact we've been taught: eating fat will make you fat and give you a heart attack. 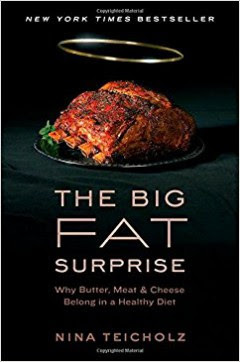 In The Big Fat Surprise: Why Butter, Meat and Cheese Belong in a Healthy Diet, journalist Nina Teicholz details how big a lie that is and how it came about. It turns out that the whole "fat is bad" theory is nothing more than a theory, supported by weak evidence, made into an assertion by the strong personalities and influence of big name researchers starting with Ancel Keys. "How is it possible that so many esteemed authorities could have made such an error? The answer is long and complex, but it is, like so many other tragic stories, one of personal ambition and money." Teicholz really delves into the history of modern nutritional common wisdom, and how dissenting voices were ignored and scoffed at, basically until Atkins went directly to the public with his low-carb, high fat diet. Too many people got healthy on the Atkins diet for it to be ignored. In fact most of the book is devoted to the history of modern dietary advice that I ended up skimming it. For me the first two chapters and the last two chapters were the most interesting. Teicholz includes in her history the impact of fellow journalist Gary Taubes, with his then controversial 2002 New York Times article "What if It's All Been a Big Fat Lie?." 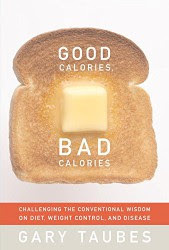 He later expanded on this by writing Good Calories, Bad Calories in 2007, another politically incorrect dietary book which is still a bestseller today. 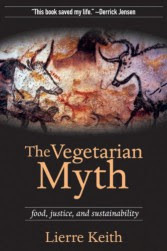 As a dessert topping to these politically incorrect diet books, I want to mention a book on my to-read list: The Vegetarian Myth: Food, Justice, and Sustainability by ex-vegan Lierre Keith. It tackles another fake fact - that eating plants is healthy for us and for the planet. Based on the reviews, vegetarians absolutely hate this book. Read books, eat bacon, be happy.